Download this Onboarding Infographic here. This can include Facebook, Twitter, Instagram, LinkedIn, Yelp, or Google My Business. Only include profiles you use for business or marketing purposes. Vanity URL - if applicable. Your database of contacts in Excel format. We ask for this upfront to give our team adequate time to review, clean and upload your contacts for you. Your other option for a website is our Vanity Profile. These sites are housed in the same content style as a corporate profile, but are linked by a unique domain, such as JohnDoeLoans.com, or LoansByXYZ.com. If you already have a domain you'd like to connect to your profile, you will need to send your domain login information to Alex Johnson. This information should include a username, password, and the domain host you purchased from. If you do not own a domain name but would like to use this feature, you will need to purchase one of your own. We recommend GoDaddy.com to purchase domains. Once you find the domain you like and own it, please send the login information to Alex Johnson. Why do we ask Loan Officers to buy their own domains? Because your business is typically branded around you, the LO, rather than the company you represent, we like LOs to own their domain, as it will typically follow them if and when they leave their current company. This helps maintain your branding, much like you maintain a book of business when you transfer companies. *If you are a member of a DBA, such as PMG, America's Loans, Heroes First Home Loans, or Rocky Mountain Mortgage, your Corporate Profile will be housed on the corresponding site of your branch. While this step does not require much input from you, the Loan Officer, we do want you to know what we're working on for you and your marketing. What is it: This is your ready-made flyer platform. Your contact information, address, phone, email, etc., are automatically imported into template flyers, so all you have to do is pick your flyer and print! This platform is also referred to as CCMC Lending Tools. What is it: Yext is a social media management platform that creates and manages your profiles on over 70 digital platforms. This helps ensure you're always in front of customers searching for mortgage help on any site and also boosts your SEO value online. How do I use it: Here's the glorious thing - you don't really use this at all. Think of this as your digital assistant, working in the background while you handle the big stuff. We handle Yext - you reap the benefits. 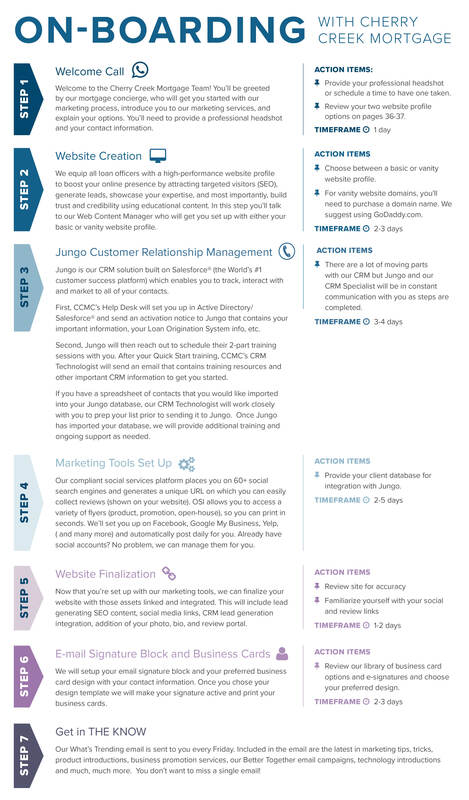 What is it: Jungo is your CRM, or Customer Relationship Management software. This is where you track communications, sort leads, and build your list of potential customers. Your standard marketing collateral includes your email signature and business cards. We will be reaching out to you for your choice and approval of business card designs. We will create your email signature based on the given contact information. You will receive this via email to approve and install. We've created a new, simple process for you to order business cards for yourself anytime you need. Follow the steps below to order your custom business cards. To view more business card options, click here. And the password is: CCMC! 3. Order the business cards you like the most! 4. The best part of all is once you order business cards through this site it will keep your previous order so you can easily order more cards with just a few clicks! Since we are just launching this on a large scale there still may be a couple bugs you come across. If you happen to run into any trouble while ordering cards please email marketingservices@ccmclending.com and we will get those issues fixed as soon as possible. Important note: This product is currently only available for Cherry Creek employees. We are still in the testing phases for DBAs. If you are a DBA of Cherry Creek or if the templates provided don’t fulfill your needs, you can still order business cards by emailing marketingservices@ccmclending.com. Congrats! You're now a member of the Cherry Creek Mortgage team with an arsenal of marketing technology to back you up. Now that you've been on-boarded, it's time to get your name out there. View our library of marketing products and reach out to someone on our team to get going.